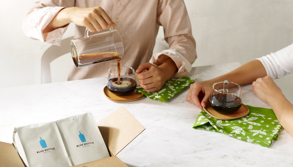 At Blue Bottle, we like to think of ourselves as a literary group of coffee lovers. From our affinity for National Poetry Month to our penchant for enjoying a good book with our coffee, we’re moved by written language in a way that feels inextricable from our raison d'être. Maybe it’s all those hours spent searching for the words to describe even one individual coffee’s particular deliciousness. It’s no accident that we now find ourselves in Boston and its surrounding suburbs, a region with a rich literary history. From Henry David Thoreau to Angelina Weld Grimké to Frank Bidart, the legions of writers who have lived here (many in order to attend Harvard University, only a stone’s throw from this cafe) will never fail to inspire us. Should you join us here in our spacious cafe for our selection of single origin, blend, and espresso coffees, we’ll be just as pleased to talk books with you as we will coffee; luckily for all of us, we don’t have to choose favorites.